For a long time I struggled to come up with an easy to way to make quick notes on the fly. I rely on the GTD (Getting Things Done) system and I’m constantly making notes of things I need to do or think about later. 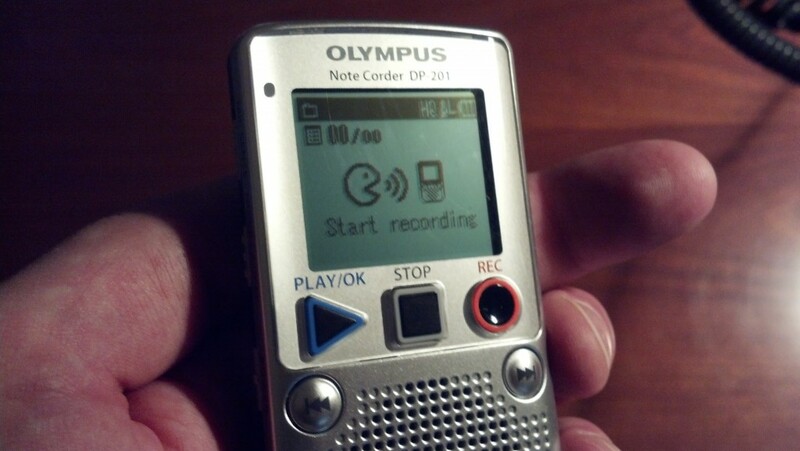 The Olympus Note Corder DP-201 was my first device I purchased designed specifically for voice recording and I’m liking it a lot. Doing on-the-fly note taking is hard, I found, with pen/paper or a cell phone. Why? Pen/paper requires me to be able to write, which is easy, yet very hard to do when I’m driving, for example. Cell phone note taking is less than desirable in my experience, with the apps used to do so being a little cumbersome and requiring me to click too many things or go through too many steps to take a simple voice note or type something into my phone. And once again it is hard to input a note into a cell phone while driving. 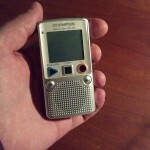 That’s where this handy, cheap little digital voice recorder comes in for me. I use it to dump ideas from my brain quickly and easily, for processing at a later time. Especially while driving. My mind goes wild when I’m driving around town or down the highway, and that’s when I usually come up with my best ideas or want to take notes on ideas and things to do. 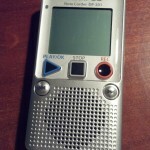 What do I use this voice recorder for? So I basically use this voice recorder to collect information that is critical to business operations or to get idea out of my head. Once a week, during my weekly review where I go through all my inboxes and set a plan for the upcoming week, I review all my notes and make tasks and add my mileage to my mileage log spreadsheets. 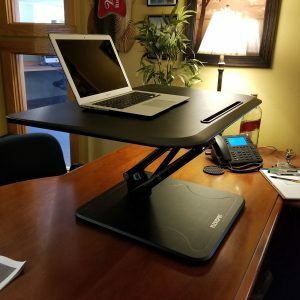 This works well for me, and helps me stick to the concepts of the GTD system without piling up lots of notebook paper or fumbling with awkward cell phone apps. How does the Olympus Note Corder DP-201 work? This is a fairly simple device to use, I started using this thing without even have to read any instructions. There is a power switch on the left side of the device, which can be used to keep the device from activating it’s recorder accidentally. 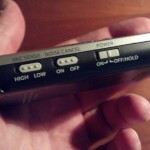 When I have it in my pocket I’ll usually turn off the power, but leave it on most of the rest of the time. To record a note, you simply hit the big, red Record button on the front. Talk into the mic on the top of the device. Hit Record again to pause the recording or Stop to end the recording. You can hit Record again right away to record another note. Each note is automatically time-stamped. The left/right buttons on the front can be used to cycle through the notes you’ve already recorded. The Play button plays back the notes. 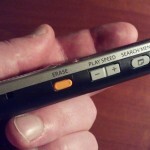 There is a volume adjustment dial on the top to increase or decrease volume during playback. All recordings done on a single day get grouped together and can be erased as a group or individually by hitting the Erase button on the right side of the device. When I go through my recorded notes each week, I can see what date I recorded each note easily, which is nice for the mileage tracking notes. I can also delete all notes in a particular date after reviewing them, as a group, to save time clearing notes that I’ve processed from the device. There is a noise cancelling feature that can be turned on and off. This can help dampen background noise. 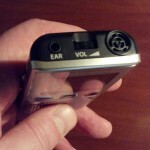 I find this feature useful when in my car or when in places like coffee shops with heavy background noise. There is a mic sensitivity switch that can help the mic pick up more quiet sounds as well. I haven’t used this feature much but when I did use it, it worked well. You can search your notes by date or filename, which can be helpful if you store a lot of notes on this device over time. If you don’t want to use the speaker on the device to play back your notes, you can plug in headphones via the headphone jack on the top of the device. And last but not least – there is a playback speed feature, which lets you speed up or slow down the speed at which your notes play when you are listening to them. This can be very useful if you are trying to transcribe notes or decipher things that are spoken quickly, in my experience. The device has 2GB of built in memory, which can do about 200 hours of recording time. There is no way to swap, remove or upgrade memory. 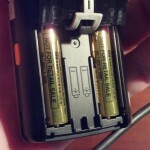 It runs on 2x AAA batteries. The batteries that came with the device haven’t even dropped a single bar on the battery life indicator, and I’ve been using this device daily for over a month now. The screen is small and shows vital info. You can see the battery life, info about recording progress, note dates and more. The screen is not back-lit, so you will need to keep that in consideration when in low-light situations if you need to see the screen for any reason. I mostly don’t find the screen to be needed very often, this is a very easy-to-use device even without the info on the screen. The screen comes in most handy when searching for notes or erasing notes. Recording new notes is super easy to do without looking at the screen. 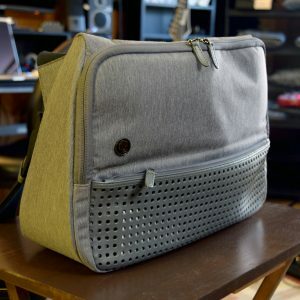 The device also has a built-in speaker, allowing you to use it fully without having to connect it to other audio systems for playback. There is no USB connection, you can’t dump notes and files from this device to computer. I paid less than $25 for the Olympus Note Corder DP-201 at Amazon, I consider that to be a very good value considering how useful I’ve found this recorder to be. Who should buy this device? 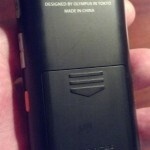 Anybody that needs a basic digital voice recorder that doesn’t want to spend a lot of cash. Many digital recorders can be $50 or much more. 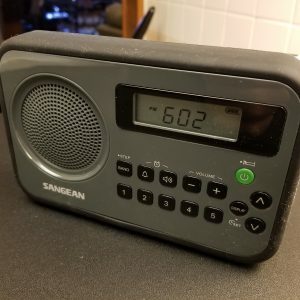 The more expensive models of digital recorders might have upgradable memory, back-lit screens, various recording modes and USB connections. But this device does not. It’s a basic record-and-playback device that works great for a great price. I think this is a great value for the money, and would recommend it to anybody that needs a digital voice recorder and doesn’t want to spend a lot of money.